Until Tuesday, it had been 25 years since I last visited Battle Ground. Back in the day, I frequented the area as a substitute teacher. Tuesday's trip was a beer excursion. I was checking out Barrel Mountain Brewing for an upcoming review. Battle Ground was a pretty quiet town in the old days. The population in 1990 was less than 3,800 according to Census numbers. The estimated population in 2014 was nearly 19,000. Obviously, a lot has changed. There's a growing, bustling business district now. There was nothing like that in 1990. 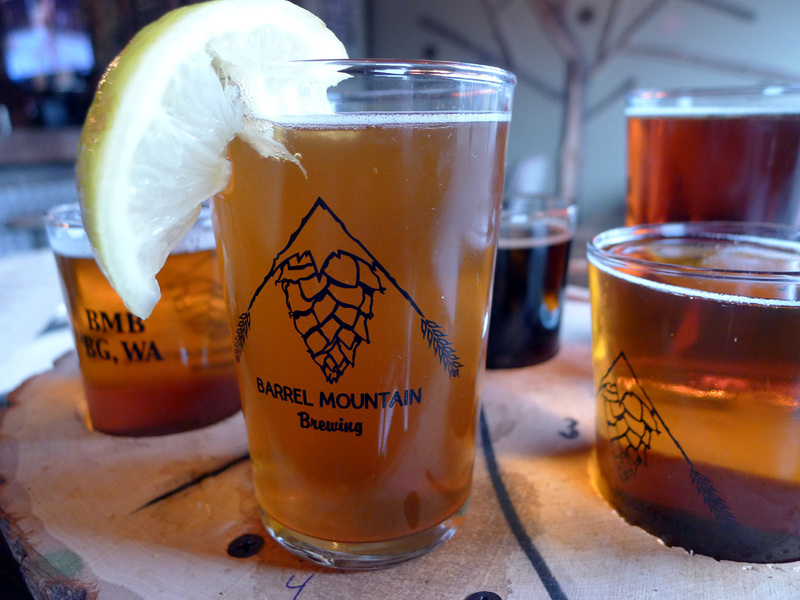 Barrel Mountain Brewing is a pleasing and, I'm quite sure, welcome addition to the local scene. Since opening last summer, they've built a following with a nice selection of beers and a menu I'd describe as standard-plus pub fare. I'll have more to say about Barrel Mountain in Willamette Week's 2016 Beer Guide, which hits news stands in February. For now, it serves as an example of possibly the most positive trend of 2015, that being the trend of small breweries expanding into suburban and rural settings. Having worked in Clark County from 1990 to 2009, I watched a few breweries come and go. But it was mostly a dead zone. Over the course of the last few years, things have turned. Residents are no longer forced to traverse the Columbia River to find good beer. They can find it closer to home. The current trend was obviously a long time coming. For many years, you had to wonder when it would happen, if it would happen. There are a lot of underserved areas, like Battle Ground, that are starved for good beer and ready to support a brewery or breweries. Finally, it's happening. Of course, the trend isn't strictly confined to suburban or rural areas. Many underserved boroughs in cities are also getting breweries or craft-centric pubs. What's different and especially positive is that the craft movement is spreading to suburbia and the countryside. Some fear the US brewery count, which now exceeds 4,000, is untenable. For production breweries, there surely is a limit. But there are an almost endless number of viable locations available to small, brewpub-type operations. Expansion into these areas will likely continue in 2016. No one I know expects the pace of acquisitions to slow. Big beer market share is plummeting. Craft beer market share is growing. Big beer recognizes that tasteless, mass market lagers don't have a bright future. So they're investing in the guys they can't beat. I have to admit being less bothered by the buyouts, which I expect, than by the reaction to them by some in the industry. There are those who see the buyouts as nothing more than some sort of natural progression in which big beer embraces craft beer as it's own and moves on. Nothing could be further from the truth. Big beer, particularly Anheuser-Busch, is buying craft brands so it can use them to leverage its position. They want to blur the perception of what craft beer is and squeeze market access via vertical integration wherever possible, to the detriment of independent craft brewers. I'm truly astounded when I hear people praising what the acquired breweries are doing. "Look at all the creative beers they're brewing." It doesn't matter in the least. These breweries enjoy significant advantages over independent craft brewers. It isn't close to an even playing field. As noted, I fully expect the buyouts to continue. What I'd like to see in 2016 is more widespread recognition of what the buyouts mean for the industry as we've known it. I doubt it will happen, but I can always hope. There's every reason to believe 2016 will be another highly interesting, entertaining year in beer. I look forward to watching it unfold. Happy New Year to all! One need look no further than all of the full-page Goose IPA ads in Willamette Week and corresponding cheap Goose Island kegs to see how AB-InBev sees the future. Add in their distributor incentive program, 10 Barrel pub in Denver and their plan to blur the lines of "local beer" becomes pretty clear. Exactly. But there's no threat. Because AB can't buy all craft breweries, right? Gotta love the naivety.